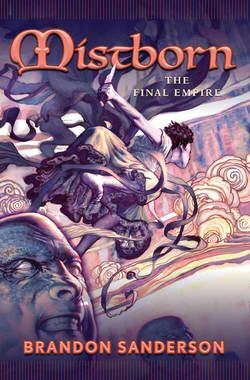 review Brandon Sanderson’s Mistborn: The Final Empire is a thoroughly satisfying beginning to what I expect will be a great trilogy. The book contains a well-thought-out system of magic and a good degree of complexity to the plot and character development. The Final Empire demonstrates that Sanderson is an accomplished writer who knows his craft well. Plot revelations and significant events that progress the likeable and intriguing characters are doled out at regular intervals and make the book quite suited to the modern reader. There’s just enough in a chapter to make it to your bus stop every morning and leave you wanting more. And the book’s meaty conclusion brings its various threads together well. The copy of the book we reviewed was simply entitled Mistborn, but there are two more books in the Mistborn series: Mistborn: The Well of Ascension, and Mistborn: The Hero of Ages. Online, the first book seems mainly referred to as Mistborn: The Final Empire. The book was first published in mid-2006. The world of Mistborn is a troubled one. During the day the main slave class, known as the skaa, works its bodies into the ground in mind-numbing servitude while ash perennially falls from the sky upon their heads. Nothing about the skaa is considered sacred; not their possessions, their lives, even their women. Their whole world belongs to the noble class which sits above them. In contrast to the skaa, the noble class spends most of its time living a life of luxury; attending and hosting splendid balls, conducting trade and playing politics against its own members in an attempt to gain advantage. At night, however, things change. The mists come out, covering the world in a blanket of fog, and any sensible skaa remains cowering indoors, away from the things which roam abroad; things, it’s rumoured, that can steal your soul. The noble class is a bit more willing to go out at night, due to its higher levels of education and protection, but even nobles aren’t completely sure what the mists hold. The only ones who do are those called Mistings and Mistborn; humans with special powers that are generated by using the energy found in various metals. Speed, more powerful senses, strength; it’s all there in one form or another. Using such techniques is known as Allomancy. And Allomany is strictly forbidden to the skaa; it’s a magic the noble class keeps for itself. The arch enforcer of these strict societal rules is the Lord Ruler; the thousand-year-old emperor who rules the world through a combination of Allomancy and bureacracy. But not all are happy with the order he maintains. Into this world comes Vin, a skaa street urchin who seems to have a knack for surviving by having more luck than those around her. The pages of Mistborn: The Final Empire will see her swept away from her pathetic life of thieving and cringing away from those more powerful than her and into a revolution that aims to topple the noble class and even the Lord Ruler himself from his milennium-old throne. I love several things about Mistborn: The Final Empire. The first is the Allomancy magic system Sanderson has created. Creating a good magic system is probably one of the hardest tasks in writing fantasy literature. Authors have to tread a careful path between the extremes of making their system too powerful, too weak, too esoteric, or too mechanistic. Critics generally praise the One Power system found in Robert Jordan’s Wheel of Time books because it sits in between all of these extremes, and I would say Sanderson’s Allomancy system is pretty good as well (if more limited than Jordan’s vision). You really care about finding out more about how Allomancy works as the book goes on, and its practitioners are constantly coming up with innovative ways to use it, especially in combat, which delivers a degree of punch to Sanderson’s action scenes. Sure, the characters can fly. But in a limited, controlled way that respects the laws of physics. Fascinating stuff. The other thing I love about Mistborn: The Final Empire is Sanderson’s sense of pacing. Just as you’re getting tired of one character’s viewpoint, he switches to another. Just as you think you understand the world he’s created, he pulls the rug out from under your feet. Just as a character begins to get comfortable with the world around them, Sanderson puts them through a plot test so they can grow and develop. Now, I won’t say that Sanderson’s accomplishment verges of the sublime. It doesn’t. The book comes across as very, very workmanlike. This is the vision of a journeyman writer; not a master. There’s no doubt that Sanderson has all the rules of fantasy writing down pat; but at least in Mistborn: The Final Empire, he hadn’t started breaking them yet. Nevertheless, this workmanlike attitude which constantly satisfies the reader is what most readers are looking for, and I would argue it would be a rare fantasy reader indeed who didn’t get a great deal of pleasure from Mistborn: The Final Empire. Sadly, I found it hard to buy Mistborn: The Final Empire in Australia. It wasn’t stocked in either mainstream or specialist speculative fiction book shops. I had to order it online from Amazon.com. Given the amount of poorly written books that are available on shelves, this goes a long way to indicating that Sanderson’s books are probably not as well-known as they should be, given the quality of the author’s prose. It’s a situation I hope to see rectified with the publication of The Gathering Storm, the next book in the Wheel of Time series that Sanderson has penned following the tragic and untimely death of series creator Robert Jordan. If you haven’t read any Brandon Sanderson yet, pick up this book. You won’t be disappointed.